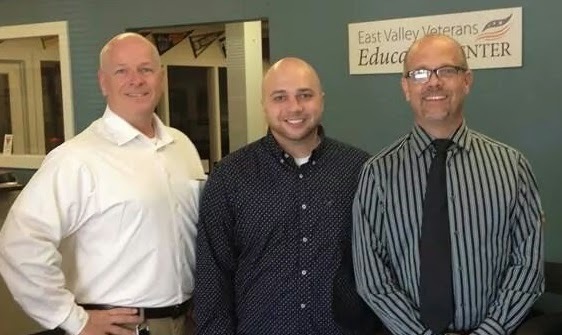 On April 7, City of Mesa Councilmembers Kevin Thompson and Chris Glover visited the East Valley Veterans Education Center (EVVEC) for an informational tour. The City of Mesa is working to address veteran homelessness so the Councilmembers visited the EVVEC to determine if the city could help provide wrap-around resources and services that could augment their initiative. City of Mesa Councilmen Kevin Thompson (right) and Chris Glover (center) tour the EVVEC with Site Coordinator, Troy Friedman (right).